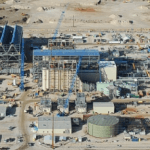 This project consisted of the removal and replacement of all ACC (Air-Cooled Condenser) components above the fan deck of the Wyodak 32-year old ACC. This was the oldest ACC to be employed in the USA. LPR teamed up with SPX Cooling Technologies to replace all the existing SDM’s (Steam Distribution Headers), CCM’s (Condensate Collection Manifolds), condenser tube bundles, structural steel a-frames that support the tube bundles, new wind walls and the installation of a new wash-down system. Due to this being an operational facility, the project required the entire streets to be fabricated at ground level and then hoisted into place at the fan deck elevation of 85’ above grade. LPR worked very closely with SPX engineers to develop modular concepts that could be fabricated during winter operation of the facility and installed during the spring outage window to avoid generation losses during the winter peak for power needs.